Ed Hartwell and Keisha Knight Pulliam’s whirlwind romance appears to have fizzled out completely, as TheYBF.com has discovered Ed is ready to sign them papers. In fact, he already filed them. 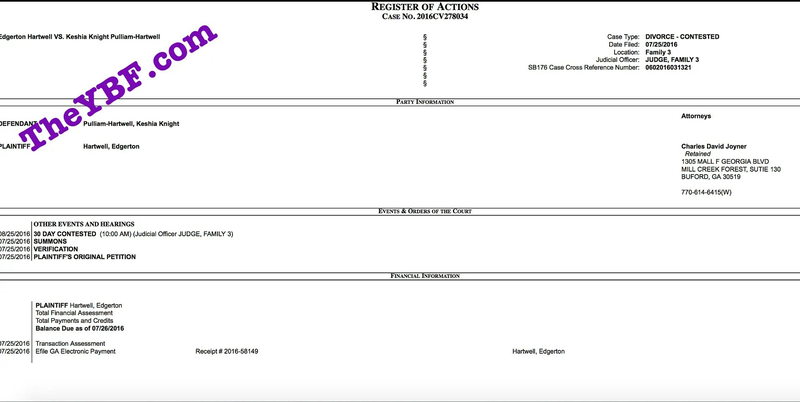 The papers were filed Monday morning in a Fulton County, Georgia, courthouse under the name Edgerton Hartwell II and cited irreconcilable differences “such as constant disagreements on life changing decisions that couples typically make together” as the reason for the dissolution request. Keisha, reportedly, is unaware of the filing — or at least she was before now — and had no idea her newlywed husband wanted out of the marriage or to remain single. This news comes just a little more than seven months after we found out the two had surprisingly jumped the broom at the beginning of the year. But what makes the discovery even more sad is Keisha’s recent revelation that’s she’s pregnant and expecting a baby girl.